“Negativity Bias”, psychologists’ term for our collective hunger to hear, and remember bad news. There’s some evidence that people respond quicker to negative words. We have been conditioned to crave the bad news, we have to change our thinking on a Global level to create change. What if we could change the mindset and start airing more good news, the impact on humanity could be Extraordinary! People with powerful messages that don’t necessarily carry an agenda are on the verge of becoming obsolete. Most networks are very costly for the expert and control the content. We want to change all that by funding a network with shows that will save lives and transform us to a better world. Our Solution: Bring back BALANCE to the media and expand a network with the latest technology to bring positive messages to the world. Our Five Point Strategy to Get it Done! 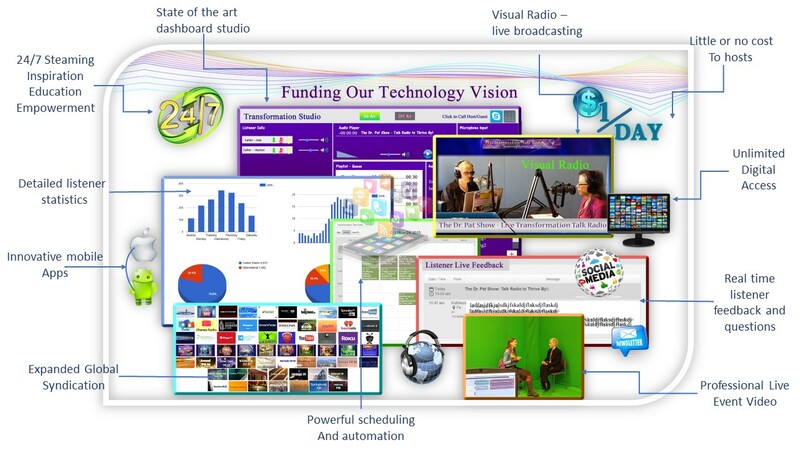 Meet RIDA – Real-time Interactive Dashboard Application: An end user interface with state-of-the-art technology which will enable hosts to reach listeners in the most innovative ways, including: visual radio with graphics, RSS feed messaging during a live show delivered to all social media, with live in-studio producers. Meet UBERT – “Ubiquitous Back End Radio Technology – Ubert” is a bridging technology that an individual host, a whole channel, or even an entire radio or TV network complete with host information, videos, blog content, and more can plug in and benefit from the community. Meet CANDOITS! Articles, Tips, Seminars, Workshops, and Live Multimedia, all from the people who are dedicated to share their knowledge, experience, and tools to transform the world. They are the “Candoits” so that ALL of us CAN DO IT TOO! Visit www.thetransformationnetwork.com to see the Beta site. VIBE – Virtual Information Bridge Engine. A global marketing strategy to promote hosts and their shows without restrictive agreements. When listeners find us, they stay! We want to help point listeners in the direction of transformative talk connected by UBERT and delivered by RIDA. Our research says that when listeners find us, they stay! This open source media that enables any other host, network, or channel to pick up your show. Please join us so you can connect with like-minded people…. invite your friends, fans, and community to help support all of us! To sign up as a Partner Click Here. Donate a free gift for our Crowdfunding Perks! 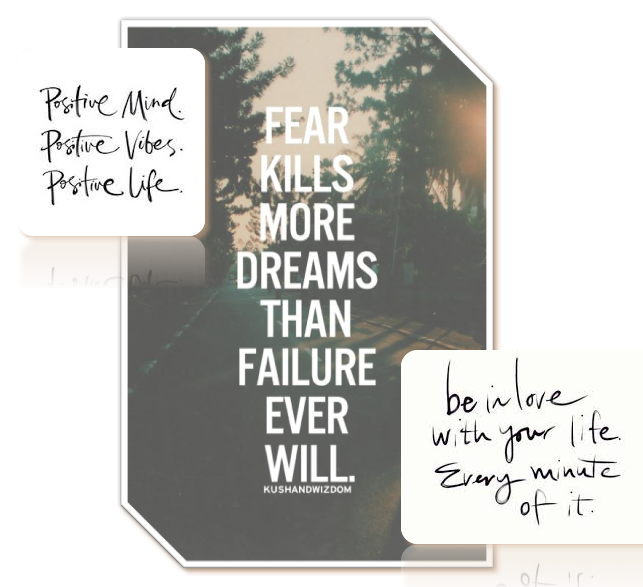 Some ideas are audio and video downloads, a seat in a mastermind group, course or workshop, or maybe an autographed e-book. It should be something unique or not widely-used. Your gift will go to the people donating to Take Back Talk Radio Crowdfunding Campaign. To sign up as our partner and offer something, please visit our partner page by clicking here! Spread the word to donate! Once we have launched our crowdfunding page, we will supply you with an email, social media links, and website information to send to your community to inform them about this crucial, life-changing project and to donate to Take Back to Give Back crowdfunding campaign. You will also receive new links throughout the process and we will mention you live on our radio network as a partner. 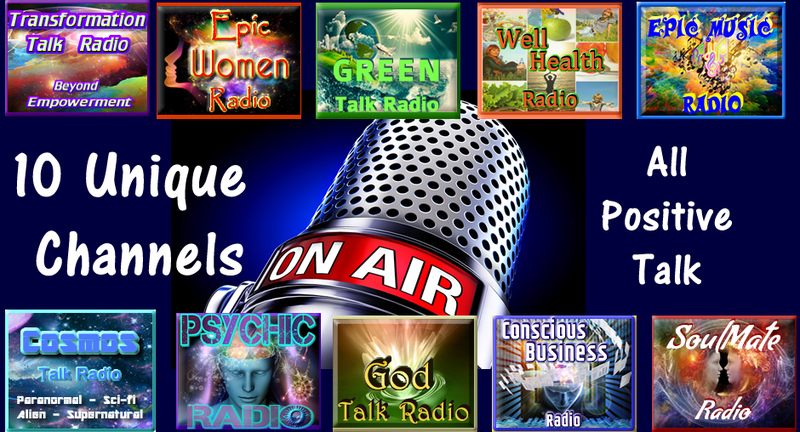 Our purpose and passion is to ensure the ongoing availability of conscious media and positive talk radio. 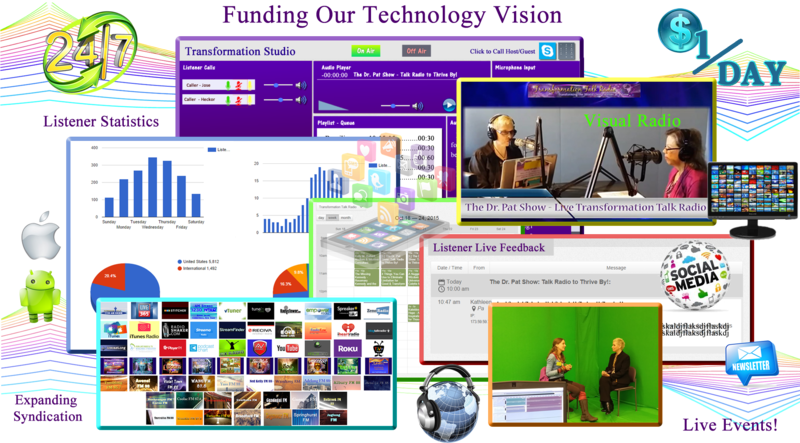 Our mission is to keep expanding the visibility of one of the most active forms of listening and to use leading edge technology to meet the growing listener demand for positive and uplifting radio.